However you decide to enjoy the Loch Katrine Experience we are sure that you will fall in love with its astonishing landscapes, as so many others have done - offering endless opportunities to enjoy the beauty and majesty of the Trossachs. The famous steamship 'Sir Walter Scott', has been a familiar sight on these waters for over a hundred years, and no visit is complete without a cruise on this historic steamship. With sailings up to four times a day during the summer season - and three times a day on our modern vessel 'Lady of the Lake - this is the perfect way to experience the beauty of Loch Katrine. Relax with a coffee or a glass of wine, as the crew regale you with tales drawn from the fistory and folklore of the ...including accounts of the mythic origins of the Loch, and the mysterious disappearance of the steamer 'Gypsy', to be found in the 'Tales From The Stirling GhostWalk' section of this website. 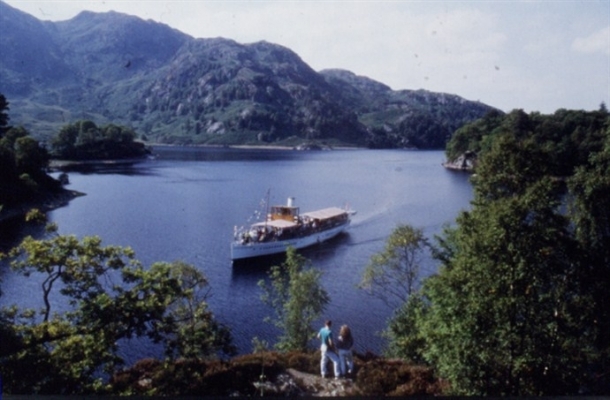 The 'Two Lochs Tour', gives visitors an opportunity to sail on both Loch Katrine and Loch Lomond on the same day. If you are looking to do a little exercise, take a stroll along the loch, or a family cycle adventure, hiring your bikes at 'Katrine Wheelz', who have a wide selection of bikes to choose from. 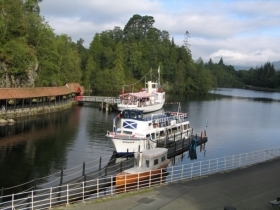 The Loch Katrine Experiece also provides a unique venue for private charters, weddings, and special events - including an annual Jazz Cruise, each October.